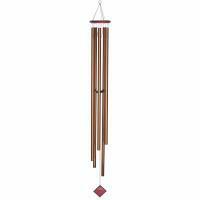 • Alto chimes use 1-1/2" diameter tubing and are approximately 48" in overall length and shortest is 24". My wife and I purchased the Mongolian Alto wind chimes as an anniversary present and couldn't be happier with our choice. The product quality exceeded our expectations. It is very heavy and sturdy with excellent sounds. The delivery time, as well as cost, of the product could not be better. Believe me, my wife looked everywhere. Thanks for the fine service. 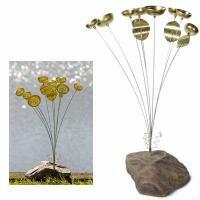 This is a wonderful, high-quality wind chime. The tones are deep and lush and it is very well-made. We enjoy it every day on our lanai! It was a gift for my husband and he absolutely loves it. 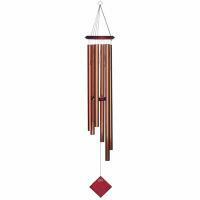 He says it is one of the best sounding wind chimes he has ever heard. It is wonderful chimes at a fantastic price! It has a very soothing sound and it is an excellent quality product! I am extremely satisfied. We enjoy listening to the chimes on our outdoor patio. It has the most beautiful tones I could ever imagine. I bought the wind chimes for my wifes birthday, and she loves them. It has an absolutely beautiful sound with sturdy construction. It would be nice if it was offered with different finishes and colors. The black finish blends in with the landscape but it would be nice to have a choice of colors and wood finishes. Otherwise, as for its sounds, its the best I have heard. The quality is high and will last many years in adverse weather conditions. My wife loved them. They have the best sound of any chime we have ever heard. You provided the best deal on these that I could find, and topped that with a quick delivery (during the busy holiday season). I was very pleased with the merchandise and the service.